Saying that I was reticent about this month’s challenge is an understatement. My fear? The combination of milk chocolate and caramel that I find really odd. To me milk chocolate is just too sweet, and caramel…well it’s sugar! I was afraid I would end up with something that tastes more like an overly sweet candy than a tart. Dark chocolate being not allowed, I started to think about other ways to make the tart tastes a little less sweet than it sounds, without having to break my daring baker pledge or being pointed to as a rebel. First, I divided the recipe in half. Nothing to do with sweetness you might say, but it was to minimize any final bad surprise. Second, I wanted to have small portions, similar to petits fours, so I went with my mini brioche molds. Third, I replaced ground hazelnut in the crust by ground walnuts. I find walnuts being bitter than hazelnuts. If it makes any sense! 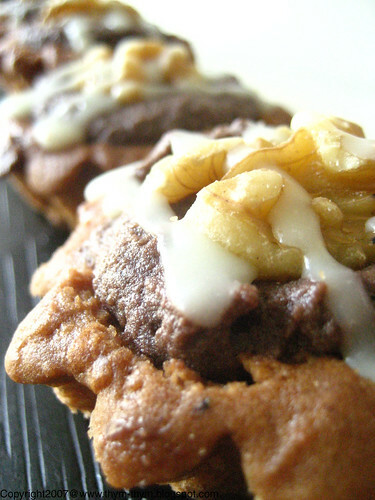 And finally, I used walnuts halves to decorate my tiny tarts instead of caramel bits. Overall, everything went smoothly. I tried to use the dry method to making caramel Veronica, but immediately switched to my usual water and sugar method when I saw it drying out. The caramel was a success, smooth with a gorgeous color. I didn’t expect the pastry to puff that much when baking. My brioche molds being so small, I didn’t have much space left to fill it with the caramel and the milk chocolate mousse. The shortbread pastry was so flaky and melts in your mouth with the exact amount of sweetness, that I couldn’t stop eating it. The milk chocolate mousse was surprisingly not as sugary as I imagined it would be! The only mistake that I made is when I finished making the mousse, before even pouring it over the cooled caramel, my daughter woke up from her nap, crying. I had to put the bowl of mousse in the fridge and went to console her. Fifteen minutes later, after wiping her tears and feeding her, I remembered the mousse. It had already set, so when pouring it over the caramel it looked more like a puree than a mousse. Despite some bumps here and there, my hubby and I enjoyed these tarts very much. We shared most of them with his co-workers who just went crazy for them. Now the combination of milk chocolate and caramel makes more sense to me, thanks to Patricia and Vero. But when it comes to chocolate nibbling, I am a dark chocolate girl through and through. You can head to Patricia's and Veronica's blogs for the recipe. I like the way you decorated them! Good idea. And brilliant idea on the walnuts rather than hazelnuts. Yum! Well done. Everyone at my work went nuts too. h, and I love the look of your tarts. Very cute. You gotta love the little ones! Very nice. 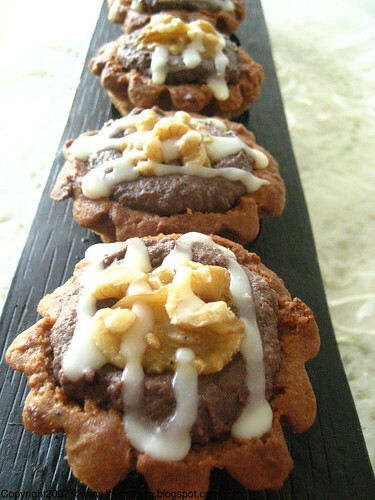 I had a secret -not so secret anymore hehe- idea to use the filling in a walnut based tart. Caramel & walnut = gorgeous! Oh they look so adorable. I too cut mine in smaller bite sizes as this was a sweet and heavy tart. You did a fantastic job Rose! Well done! I love that you used brioche molds...good thinking. Makes for some great looking tarts. I agree your brioche moulds make for lovely baby tarts :) Well done. Rose I am getting so excited to join daring baker next month. 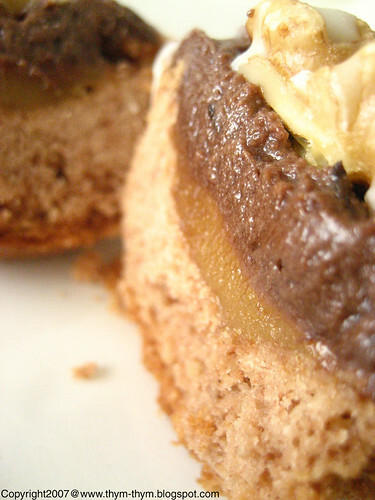 These look like they were rich and yummy and I understand having to send baked goods to work with Hubby I do that too. Your mini versions of the tart are beautiful, Rose! I liked the crust a lot, too, I will bake the rest of it (which I froze) as cookies. Lovely work, Rose! They look very classy in their mini brioche molds. Great idea using the mini brioche molds - they look great!! I knew this would be fabulous looking with nuts on top. I need to try that next time. And I'm loving those little tart pans you used. Gorgeous! The pastry definitely puffed more than I thought it would too, I found that to be a disadvantage for the little tart because I couldn't fit as much filling in. I love how the mini tarts turned out! That would be so perfect for an Hors D'Hoeuvres party. Lovely!!! I love the modifications you made... especially the brioche pans. What a clever way to present single-serving tarts. They are such cute little guys! I want to pop them one after the other! Your tarts are just beautiful! Well done! I love the little tarts -- and I love that each of the Daring Bakers has done some just a bit different with the same recipe. I was so close to using my mini brioche molds, that would have been funny...instead I rememberd the stack of minis I had in my baking box. They look divine. Great job!! Your mini tarts are so adorable! Great job! Your mini tarts are so cute! They look beautiful. Perfect bite sized pieces! - Thanks everyone for your sweet comments. The daring group had thaught me a lot and I really enjoy being part of it. So thank you and thank you. How wonderful your little tarts look! J'adore la version miniature. Si j'avais eu des moules mini chez ma soeur je pense que j'aurai fait des tartelettes individuelles aussi. C'est tres joli, mais comme toi je prefere le chocolat noir. I had a mousse/fridge mishap too, but your brioche tarts still look lovely! Rose, I think that this is an excellent way to lessen the sweetness of the filling. Your tartlets look beautiful. Walnuts for hazelnuts -- genius! Very cute petit fours. Rose these are totally lovely. Awesome! I was surprise that these did not overwhelm me with sugar sweetness! And i really liked the cinnamon. Great little tarts and nicely decorated, too. I was wondering how the crust worked with very small tarts. More like a cookie I guess, but very, very nice. Your little tartlets look incredibly adorable Rose. Great idea to substitute walnuts. Your miniature tarts are so cute. I think you were clever to use walnuts. I love your mini tarts and your decoration! I, too, love the minis. Yum! Excellent Job Rose! Glad you decided to overcome your aversion to milk chocolate for this challenge.